Iron is one of the most common raw materials mined on Earth, taking up about 5% of the Earth�s crust. 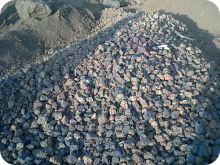 It is extracted from beneath the surface rock, crushed and then concentrated. It then can either be transformed into iron pellets mainly used in blast furnaces, or sold as concentrates. Iron ore is the raw material used to make pig iron, which is one of the main raw materials used to produce steel for the world's iron and steel industries and is one of the most used materials in today�s modern world. Iron ore is mined in about 50 countries. The seven largest of these producing countries account for about three-quarters of global production. Australia and Brazil are the largest producers and together dominate the world's iron ore exports, each having about one-third of total exports. We can provde IRON Fe 63.5% directly from our mines in Chile and or Mexico starting off minimum orders of 50.000mt/month up to 600.000mt/month contract. Priced at Market U metal rate. PRICE MECHANISM: Price shall be FOB/CNF/CIF loading and unloading ports are based on �Marketscan� per metric ton less discount USD /MT, plus + cost of freight to be paid at actual rate for Ore, per standard specification.